There is something about a nice smelling house that I am a sucker for and Glasshouse is definitely one of my favourite brands for lovely scented candles. They really step up their game above all the rest for intensely scented candles that fill up an entire room. 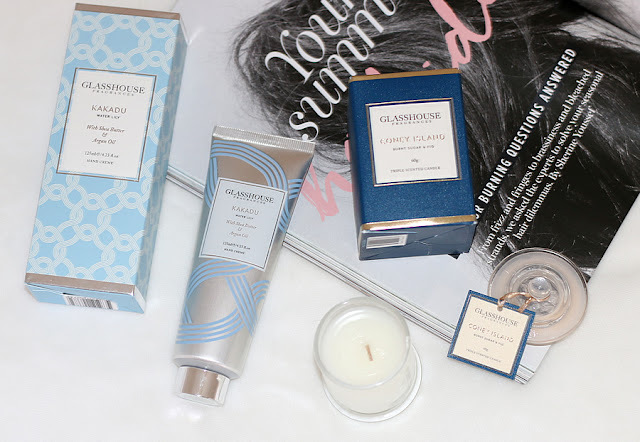 I wanted to share with you two new Glasshouse favourites that I am giving a go and am loving so far so I would highly recommend. Let's start out with the candle because let's be real - their candles are so amazing. This scent is in Coney Island which is burnt sugar and fig. It has a sweet and fruity scent to it that makes it one of their dessert like scents. It isn't over the top sweet though because although I do love their very sweet caramel ones, sometimes for the lounge room you want something a little more subtle and neutral. I think this candle would be great in the lounge room, kitchen or bathroom. This little baby version of the candle is $18.95 and available from here. The full size is $42.95 and is currently available in limited edition packaging. 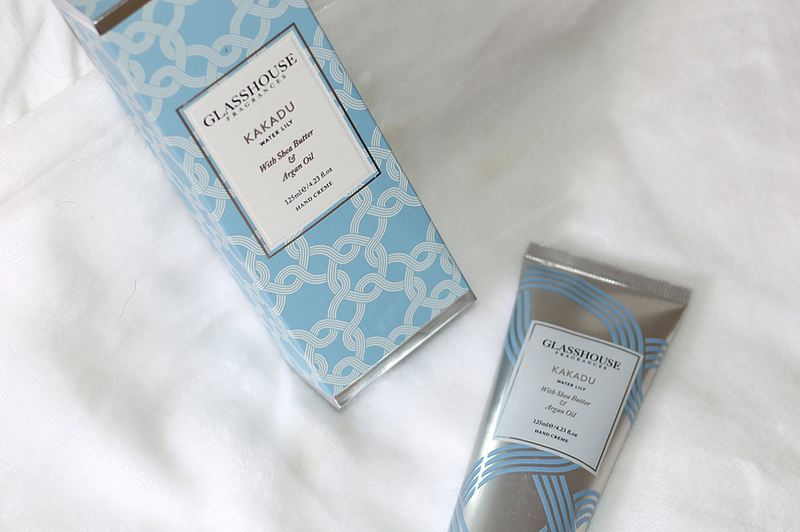 This next product is actually a hand cream and the very first one from Glasshouse that I have ever tried. 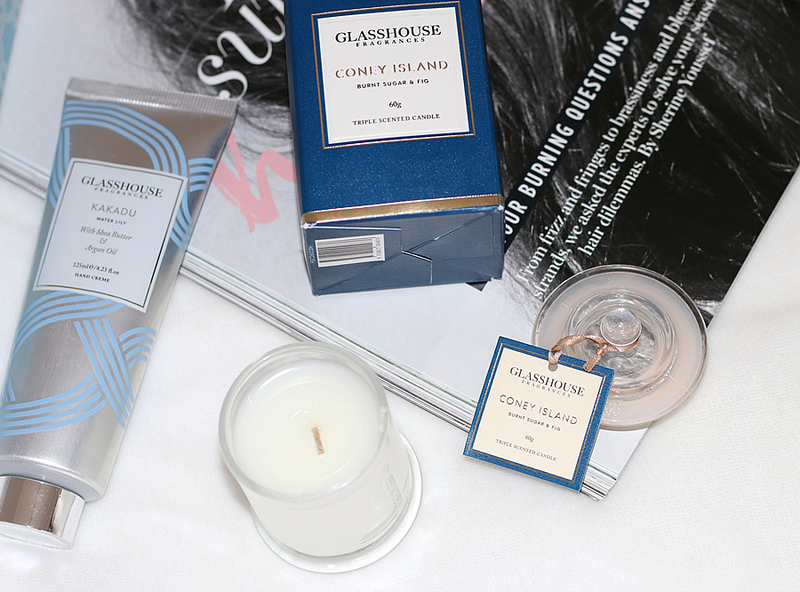 The scent is Kakadu which is based on water lily making it light and floral. Not only does it smell amazing but it actually works really well to hydrate your hands, using the power of shea butter, macadamia and argan oil. This is a match made in heaven of nourishing oils because it leaves your hands smooth and smelling amazing. I also love how you can apply this all throughout the day because it is a non greasy formulation. This product retails for $24.95 and you can purchase it here. So those are two new Glasshouse favourites that have entered my life recently and I have been loving. If you are looking to add a bit of luxury into your house or skincare routine then I would definitely recommend these two products.